Mira Element > Concealed Thermostatic Shower Valve With Round Shower Head. 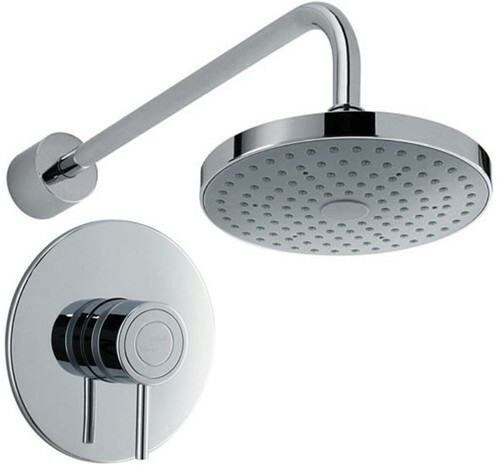 Mira Element SLT BIR concealed thermostatic shower valve in chrome with round shower head and arm. The best performing single lever mixer shower on the market. You can fine-tune the settings easily to create your perfect shower every time. With 'Lift and Twist' technology, one single lever control for flow and temperature. Eco flow function uses up to 30% less water. Single spray 18.5cm deluge fixed showerhead. Wall mounting shower arm included. 5 Year guarantee: Mira guarantee this Element shower for 5 years. The Mira Element range of showers offers thermostatic temperature control and flow control with one simple to use dial. Mira Element shower valves make showering beautifully simple and stunningly affordable. 5 Year guarantee: Mira guarantee their Element showers for 5 years.